Even though we live in a 24×7, connected-all-the-time, let-me-Google-that kind of world, there’s something to be said for the still-mysterious incident of the coming upon something unexpected; something you weren’t looking for, weren’t expecting, or even knew existed. Why that thing, why your life, why right then? But then the thing happens, and the mystery turns into happiness, because you no longer care about the why of it, you only care about the it of it. And that’s what happened to me the other day, when (and I’m not sure this is how it happened) I saw a little thing in a little post on a little calendar online, about a concert at a historical house less than three miles from the house. On a Wednesday night. Two fellas from PEI (Prince Edward Island) (up in Canada), playing the fiddle and the guitar. I can’t really put my finger on it, the thing that made me say, “Hey, let’s go to that,” but serendipity answers to no wo/man. It’s nice to know that sometimes “I dunno” is actually the truth and not some lame, lazy shrug meant to wiggle out of having to put the energy into explaining yourself. 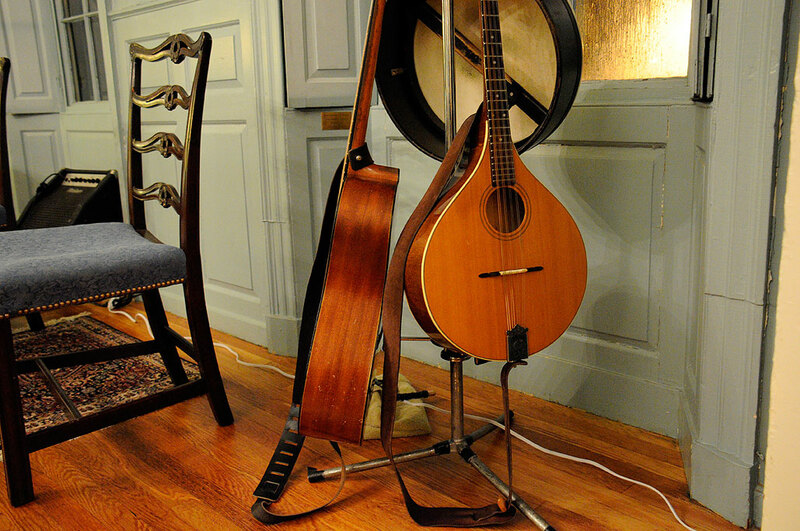 Anyhoo, we went to hear/see/watch this fantastic, acoustic performance of Richard Wood (fiddler) and Gordon Belsher (guitar, a mandola named “Nelson Mandola,” etc.) and we didn’t even know we were going to! That’s what Richard and Gordon said, not me. 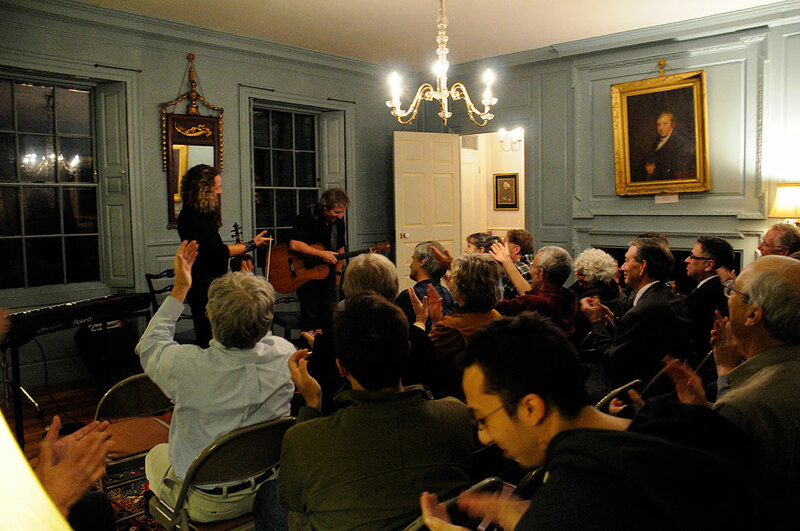 The Loring-Greenough House, in whose parlor we were listening to these two, fit about 20, although there were 30. There was so much excitement in this audience, that they were here and they were here, all in this parlor that originally belonged to (gasp!) a Tory family. It was just so exciting to be part of this excitement, and we weren’t even expecting it! So this is what I know, now: where you play is not who you are. I was four rows from guys that played for both Queen Elizabeth AND Gene Simmons, and played with Shania Twain AND The Chieftains. And you know what? They were having a blast, just playing for a small but oh-meye-gawd enthusiastic crowd. The music is the music regardless of where it’s being played. And good lord what music. About halfway through the first half, it dawned on me that nobody plays like this. Except these guys. Talk about top of their game. They loved what they did, no matter where they did it. Just, wow. So much sound, and being so close we could see the sound being made. There was so much toe tapping from the audience that the the mirror on the wall was shaking – even though we were toe tapping on the carpet! NB: Expect that any musician from PEI will have musical friends in Scotland. Just expect it. So what did they play? An “Anne of Green Gables” song called Red Haired Girl composed by Gordon’s good friend Mark Haines (who, when he wrote it, told Gordon, “I think I’ve written a ‘Gordon Belsher’ song!”) an Irish minuet by Carolan (a blind Irish harper whose likeness was on the old 50 Irish pound banknote), stuff from Winston Scotty Fitzgerald which they said was kind of like “step dancing to fiddle music,” traditional Celtic music–from Galicia. Music they wrote, music others wrote. Honestly, you kind of couldn’t help but hoop and holler. Go ahead, have a listen for yourself.